We help you play a more consistent and improved game. 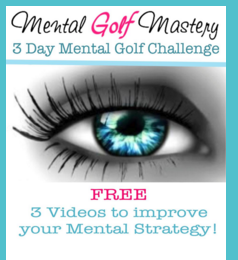 Mental Golf Mastery is a program created for you, the female golfer, whether you are a casual, match or professional player, you will discover the mental secrets of top level golfers and champions. True success comes from within and has to do more with what you say to yourself than what others are saying about you. Discover how internal factors rather than external, have more of an affect on your ability to win and succeed than you may have previous believed. The women I work with admit to struggling with certain aspects of their mental game, most even admit to me to not even addressing this side of their game at all, believing that their thoughts and lack of confidence is just part of who they are. Being an athlete myself I have researched the secrets of that the pros use to give them an edge and I help golfers take control of their mental game so they can play with confidence, focus and a new level of enjoyment. My Mental Golf Mastery Program includes powerful tools based in psychology, personal development and science. It is truly an “inside out” approach to improving your golf game. Presently I am working in the Philadelphia area, providing women with a personal experience either in groups or individual sessions. I am also available to help you online if you are not in the immediate area. My program gives you the competitive edge you’ve been looking for. These simple secrets will allow you focus, find your confidence and play at the level you are capable of achieving. Most golfers have invested in the clubs, the outfits, and the lessons isn’t it time to invest in the most important aspect and gain mental mastery?.